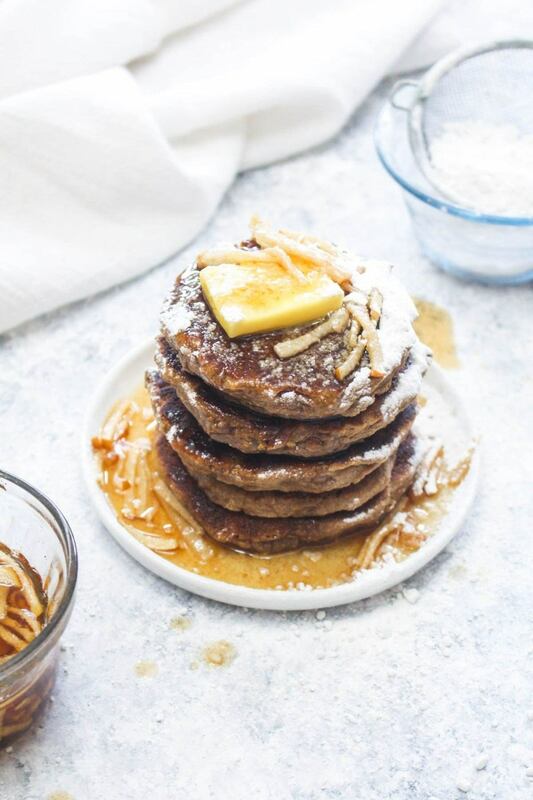 Cinnamon Pancakes with Pear Maple Syrup are a light and fluffy gluten free and vegan pancake recipe! This healthy breakfast gets smothered in a 10 minute holiday spiced syrup. In a bowl, whisk together the oat flour, coconut sugar, baking powder, and cinnamon. Set aside. In a small bowl, whisk together the almond milk, apple sauce, oil, vinegar, and vanilla. Add the wet ingredients into the dry and stir to combine. Set a nonstick skillet over medium low heat. Spray the pan with nonstick cooking spray and preheat the pan for 3-5 minutes, or until its warm. Using a 1/4 cup measure, scoop the batter into the pan. Cook the pancakes for 5 minutes, or until the surface has evenly darkened in color , including the middle. Flop and cook for another 3-5 minutes or until the pancake is firm, not squishy, when you poke the center. Repeat with the remaining pancakes. While the pancakes are cooking. Add all the syrup ingredients into a pot. Cook, on low heat, until the syrup is warmed through. Serve pancakes topped with syrup and vegan butter, if desired.